A few years ago, I started running. It seemed everyone was doing it and I had this vision of training for a 5k. I cried the night, yes literally cried in the middle of the gym, the night I ran twenty minutes straight. I loved the high I felt as I ran and loved the sense of accomplishment. I was only into running for a brief period of time but in that time I learned the difference between running on the treadmill and the real road. The real road, even the flattest of roads, is more difficult to run on. Or walk on for that matter. There is a reason the prayer says, “May the road rise to meet you…” On the treadmill, the road really does rise to meet you and even propels you forward as the belt rolls round and round. I was thinking about this again earlier this week as I was walking…and even doing a little running despite my orthopedic surgeons advice to never run again…. I was also thinking about all of the ways that I try to stay on the treadmill in other areas of my life. Relationships I want on my own terms, avoiding the dreary of day to day or conflict or the kind of deep intimacy that is always hard but always shapes and changes you for the better. I want the treadmill of relationships. I want the treadmill of church involvement sometimes too. I want to just volunteer when it is convenient and do just what I want to do, when I want to do it, being careful not to be too dependable. Not really get involved in the hard work of community but rather be able to slip out unnoticed. I also take the “treadmill” way out of life. Let me let you in one of life’s little secrets….BEING AN ADULT IS HARD! And it never seems to get easier. Whether you are dealing with your own sickness or the sickness of those you love, cleaning your house, paying the bills, worrying about whether you will have enough for retirement, taking care of the things around your house that need fixing and maintaining, dealing with the triumphs and disappointments of work…..Sometimes all of that makes me want to take the easy way out. I don’t want to hit the pavement, I want the road to rise and meet me and because there are so many “pavement” moments in my life I sometimes take the easy way out. There is something to be said for balance and giving yourself grace when you need it. But in a world where we can take the easy way out, sometimes we have to hold our own feet to the fire…or the pavement as the case may be. We have to dive in when we’d rather just splash our feet in the warm shallow end. We have to get messy when we’d rather stay clean. Otherwise….we wind up avoiding our own lives. Living life solely on a treadmill isn’t really life at all…. The figures and tables give helpful information that will be easily accessible in the future when planning conversations with other leadership of your ministry. The additional information in the many asides in the text outline practical tools. The format in which these are all included makes this a good resource to return to in the future. The book is simple and does not try to solve the issues around having a digital presence but it simply provides a great outline for conversation and planning. 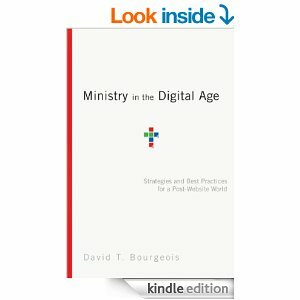 While this book does not give specific instructions on how to develop or use current technology, I would recommend this as a strategy guide for any minister, ministry team or lay team that is looking to create a dynamic digital presence for their ministry. I have a tree in my little front yard. I am not sure what it is. I thought it was a dogwood when it first started blooming in late April, even though it seemed late blooming for a dogwood. As the blossoms developed completely, it was clear the flowers were not dogwood flowers even though it seemed to be cousins with the dogwood at least. It was very pretty as it began to bloom and because it is right outside my front door, I get to walk under the blossoms every time I come in and out my front door. The problem is that the tree still has the flowers. 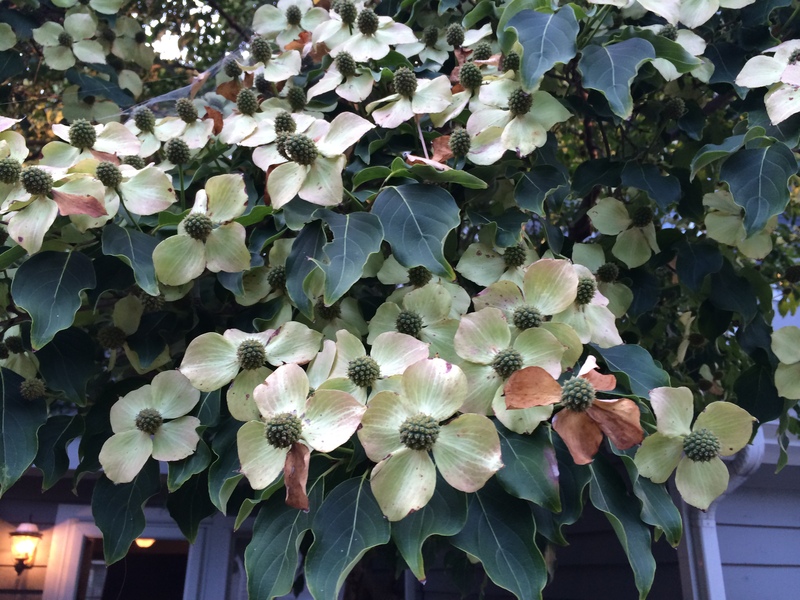 There are two other trees in the neighborhood just like it, and examining them, I see that the petals should have fallen off by now. Instead they are just turning a little brown and the leaves that are competing for the nutrients and water seem to be more shriveled. I don’t know what to do about it, but it is clear that the turning flowers are no longer a sign of health and possibility but a sign that something is very wrong. Our ministries have a lot of flowers that are still hanging around. We see them on the tree and it reminds of us the good days when the blooms first started to come. We remember the first kids in Sunday School, the GAs earning their badges, the large youth group that volunteered around the building, and the list goes on. The problem is that some of these flowers are no longer blooming. They are hanging onto the tree because we just cannot let them go. The problem arises when those flowers keep other new life from growing. We cannot develop small group ministries in homes because Sunday School is a priority. We cannot add new music or experiential aspects into worship because we have to sing the songs we sang as children. We cannot go out into the community and volunteer because we have so many leadership roles within the walls of the church. Our pastors cannot reach out to the community because they are spending so much time with those that have already been a part of the church. All the while, the flowers are still there, still hanging on and if you squint just right and look from the right angle you can see the beauty they once had, but no new growth can happen. Just as the flowers appear for a season and a purpose, so do the ministries within our churches. We can easily see the need for the changes of season but somehow we want the same blossoms in our church all the time. There is a time for the blossoms but there is a time for green growth, there is a time for fall and the leaves to fade away, there is a time for winter and a time for rest so there can be renewal and rebirth. We cannot hang on so tightly to the flowers that we harm the tree. We cannot mistake one type of growth to be the only kind of growth. Now…can anyone tell me what to do about my tree? I believe, most importantly, it would help if we each knew what our gifts were and how to present ourselves. Each of us who reads a job description, sees what we want in the words. So, obviously, it feels like we are all “competing” for the same jobs. But, what if we each knew our “specialty.” What if we knew our talents, our passion and our vision in ministry? What if we knew, as Parker Palmer states it, what it is we cannot not do? What if we could represent ourselves well, having something like a brief statement or elevator speech about our “specialty”? Then we could leave the interview, submit the resume, etc. knowing that if this was the right job for us, if it was the job we had read and dreamed about, we would get it. I was once sharing with a former coach about how hard it was to be rejected in the dating world. It made me feel like I was not enough, or too much, or something was wrong with me if the guy decided he didn’t like me enough to pursue something more. He helped me reframe he experience with an image given to him from one of his former coaches and said, “It’s like if you go shopping. You see a sweater hanging on a rack and you really like it. You try it on and it just doesn’t look right. You take it off and hang it back up and it still looks good, you still look good, you just weren’t a fit for each other. It looked better on the rack, as we always say. Nothing wrong with you, nothing wrong with the sweater.” He went on to extend the analogy to dating. You have to “try people on” to know if they are a fit. If it doesn’t fit just right, you can hang it back on the rack, or find yourself back on the rack, and it doesn’t mean anything is wrong with either of you, you just weren’t a fit together. You, as a couple, just looked better on the rack. Since this conversation, I’ve expanded this image to applying for jobs. (which I believe is much like the dating process but I’ll save that for another blog post) When I apply for the job, I describe why I believe I would be perfect for the job. I share my experiences, my vision, my gifts, etc for the job description as I read it. If they don’t choose me, it’s because it just wasn’t a fit. There’s nothing wrong with me, nothing wrong with them. I know what I look like on the rack in terms of applying for a job. I know that I have to try things on. Women know that with each item you try on, you have a better understanding of what is going to look the best, what is going to fit. It is the same with applying for jobs, with each one I get clarity about my calling, my gifts and what I’m looking for. With each person they interview, they get clarity about what qualities and experiences they are looking for. I wrote in my last blog post about this idea of churches having a specialty and I think women must embrace this idea. They have to know what they have to offer a church, know how to communicate that clearly. If five of my friends, all women, are applying for the same job but each of us knows how to describe our gifts and strengths clearly, we are each presenting something different to the interviewers. Then we aren’t competing against each other, but the church or organization is just picking the one they know will be the best fit. It’s not that those who did not get the job are less than, it’s not that there is anything wrong with the church or organization, it just wasn’t the right fit. What is your specialty? Do you know how to confidently present yourself in an interview process? Do you know what it is you cannot not do? ….I’ll be blogging about this more in the future but would also encourage to contact me or another coach if you are interested in developing answers to the questions. A few weeks ago, I was in Atlanta for the CBF General Assembly. It was a great time to see old friends and be inspired with new visions for ministry. It was also a great time to visit Rosa Mexicano, a tasty Mexican restaurant in Atlantic Station that I love. It is not one of the order by number kind of Mexican restaurants but a fancier kind of Mexican restaurant…the “bring around the cart and make the guacamole at your table” kind of place. It also has a very large tasty gluten free menu and I may or may not have eaten there three times during the course of the week. At Rosa Mexicano, when the waitress/waiter first comes to your table they ask if you are familiar with their menu and then always say, “We are known for a few specialties I will point out for you. Our drink specialty is our pomegranate margarita and our appetizer specialty is our guacamole which is made table side to your preferences.” Part of this is just smart business. If you order both of the specialties, you have already added around 25.00 to your food bill! I don’t know how they decided these would be their “specialties” but by drawing attention to them, it lets everyone who comes in know immediately what they consider to be the best they have to offer. It also says they are a restaurant that has become an expert at something, their specialities, setting them apart from other restaurants in a tough market. Scientists tell us that in an eco-system where resources have become scarce, all living things become more specialized. They become more specialized in what they eat or herds with common trait all begin to live and feed in an area that is more specifically designed for their unique trait. There are not resources everywhere so their tastes change in the foods they eat. This keeps too many from one species from competing for one food or water source. It becomes their specialty, the thing that allows them to continue living. They are not living in the same place they once were or in the same location they once were or eating once they once were. When the church was a more mainstream aspect of our cultural identity, families attended on at least a semi-regular basis and there was no scarcity. Potential church members were everywhere. Today, there is a scarcity of leaders in our churches, funds to keep them open and running and a scarcity of people attending on a regular basis. So many of our churches want to find ways to get back the numbers they had in the fifties, sixties and seventies. They want to have the family and children ministries they once had that they believe drew young families to the church. They want a youth ministry, they want Bible studies, they want everything they had before but the reality is that the resources are too scarce to recreate what once was. No fancy programming, no going door-to-door, no part time position in youth and children is going to allow the church attendance numbers to go back in time. However, this is not a discouraging word. It can be an exciting opportunity! Scarcity creates specialization. It allows us to be more precise and effective with the ministry we do. Not every church has to have every type of program. Many churches want to be like the big church in town, only smaller, but why be just like them? They’ve got that niche filled. Why not instead, monopolize on what you do have to offer? If you are a small church, make the most of that. Whittle down the list of volunteers you are recruiting to just the essentials to keep the church running and do those essentials well. Plan events that you could only do in a small church. Perhaps your congregation is much older. Bob Dale, a leadership guru here in Virginia, once shared the idea of starting new churches just for retired folks. We have the idea that we need young families to keep a church going, but there are always new populations of retired and older people to keep a church running. Do a ministry to those folks and do it well! Think about your church’s location, history, special gifts of leaders and ministers. Create your specialty around that. Find new energy in doing what you do well, and do it even better! Just like the warblers, find new ways to access resources and clearly identify what resources really need to be accessed. Just like the restaurant, find your specialty and make sure your church members know what it is. Each time they describe your church, they should be able to recite what the specialty is. They should have a clear understanding of who they are attempting to reach and what the specialty of the church is. This is your unique chance and opportunity! Find the menu and find your specialty, find a new way of getting the bugs out of trees and what bugs you want to eat. Create your niche! A little over a year ago, as I was beginning this new job, I felt like I kept having the same conversation over and over again. Whether it was about the local church, youth ministry in the local church, leadership development, our state-wide youth events, etc. the conversation always went something like this…. “Something needs to change. We are ready for a change.” Me: “What needs changing? Do you have any new ideas?” “No. I don’t know how it needs to change, it just needs to change.” I was fresh out of a church where this cycle of conversation seemed to be the norm as well. We knew things needed to change but had no language for it, no perspective for it. We always wound up using “church” language which limited us. Church language is always steeped in the traditions of our faith. To talk about canceling a program, brings up the decades of fond memories for the group and individual memories of how important that program was for their faith development. We can’t get rid of something so important. To talk about adding something into the schedule, the language always takes us back to the same things we have always done. It didn’t work before, why would it work now? To talk about changing the way we look at our facilities means that others might trespass on our holy places. I felt like I needed a new language to help leaders process the possibilities for the future. It needed to be something natural, something everyone could easily relate to and identify with. Something that would draw people in but also something that was outside of the typical ways we talk about church. As I sat on the deck of my home brainstorming with my coach, I was gazing at this tree. It suddenly became clear to me, what if we could use nature and ecology to talk about the church and leadership? I was a science teacher and have always loved biology, so I connected with this idea. I spent intentional time talking with agricultural educators, farmers, even a peanut expert. Pardon the pun, but the connections between what we are facing in the church today and the natural ecology that surrounds us provides fertile soil for lessons and a new way of thinking and talking. I guess it’s not really new at all though, Jesus knew the importance of looking at the natural world around him to teach the people, but I hope to engage ecology in a new way for a new season of ministry. Certain entries in the blog will be devoted to this idea of eco-style leadership, including one that will follow this soon. This idea is still a work in progress but I’m looking forward to sharing my ideas and thoughts with you as we all grow together.